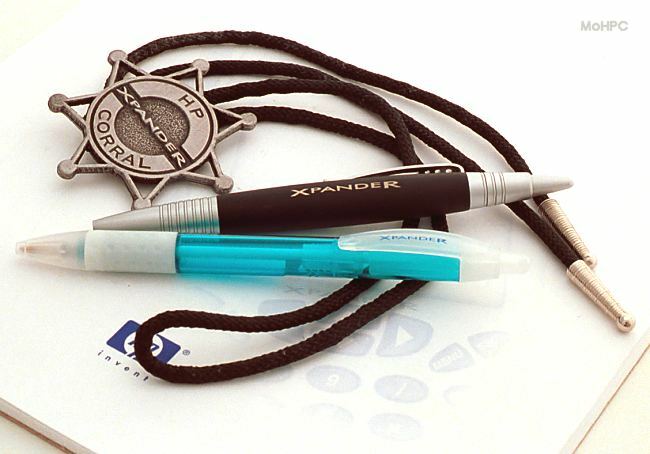 "Xpander is a new kind of hand-held learning device. It combines the portability and accessibility associated with calculators with the intuitive visual/tactile user interface associated with stylus-based palmtop organizers. The result is a machine that offers a tremendously broad spectrum of possible learning environments that can be tailored to learners from pre-school through graduate school and beyond." So began a document given out at the HP Xpander learning Summit in mid 2000. The Xpander was a dramatic departure from HP's Saturn/RPL-based calculators. It used a Hitachi SH3 processor, 8MB of RAM, 16MB of ROM and Windows CE to host a number of applications designed for learning math. 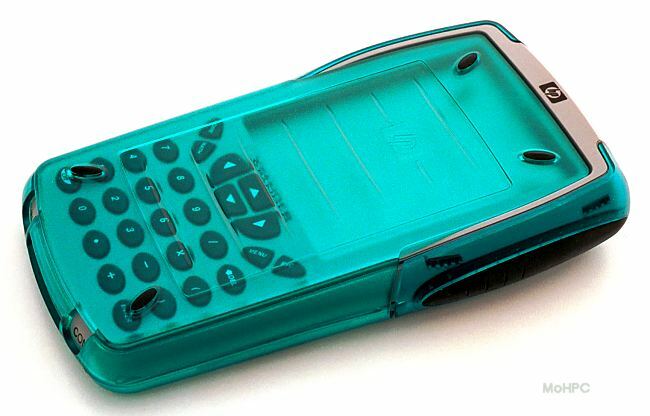 The device looked like a PDA with a 240 x 320 pixel gray-scale screen, a numeric keypad and a hard slide-on cover. Most work was done on-screen with a stylus. It also provided a compact flash slot and used rechargeable batteries. 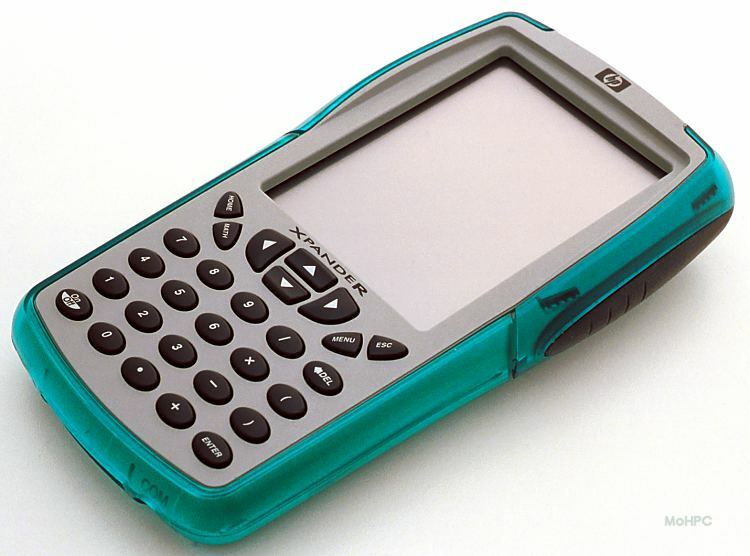 Every Xpander came with a port that allowed its screen to be projected for the classroom. 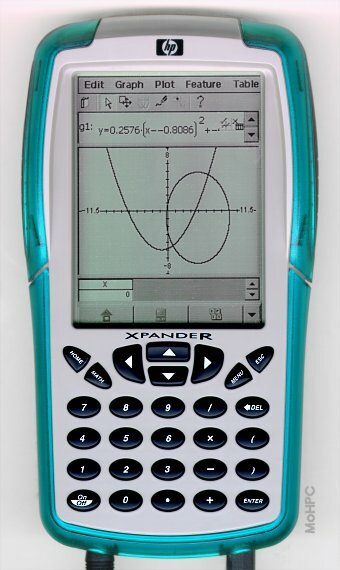 The Math Xpander (Shown as Math Explorer in some early artwork) was the main application. It provided a Workbook, a Graph environment, a Table environment and a constraint-based geometry environment. The workbook allowed for direct calculation and kept a log of all work done within itself and the other Math Xpander environments. The screen captures below show the workbook with and without the on-screen calculator keyboard displayed. Expressions could be assigned to variables by entering the expression, selecting STO and entering a variable name (one or more characters.) Variables could be entered into expressions by name. Functions could be assigned using the syntax function_name(x) := expression. For example, the user could enter f(x):=x/2 + 12 [ENTER] and then enter f(4) [ENTER] to evaluate f(4) = 14. The workbook also included a numeric root finder, which could solve equations of one or more variables. The user could then grab the graph and move it (translate) or alter it (dilate) with the formula automatically updated by the Xpander or the user could alter the formula and let the Xpander draw the resulting graph. The user could also enter the formula directly or select a graph type and then enter data points. Multiple graphs/formulas were allowed and the window could be panned and zoomed. Points and segments could also be added and measured. A table of plotted points could be displayed and modified. The table environment was essentially a spreadsheet for statistics. Any number of rows and columns of data could be entered in the table pane, and statistics were continuously updated in the statistics pane. Statistics were: Mean, Population Standard Deviation, Sample Standard Deviation, Sample Size, Sum, Minimum, 1st Quartile, Median, 3rd Quartile and Maximum. The Geometry environment allowed the user to draw geometric objects and freehand sketches. When a point was drawn close to an existing point, it was automatically snapped to the existing point making it easy to draw complex models without gaps. Constraints could be added to keep an object perpendicular, congruent, tangent, on an object, at an intersection or a midpoint. Measurements could also be taken. The Xpander allowed additional lessons to be downloaded. Several mathematical E-lessons were developed as well as a periodic table lesson which allowed the user to browse the table, get detailed information and create graphs using variables such as: atomic number, melting point, specific heat, electrical conductivity, heat of fusion etc. The Xpander was not programmable in the conventional HP calculator sense. E-Lessons, which were cross-compiled and downloaded, were the major form of programmability. Formulas allowed some customizability but the Xpander's formulas didn't allow for conditionals and looping. The Xpander came with a serial cable and software for transferring software and screen shots between the Xpander and a Windows PC. The serial cable used a small round plug that was perhaps a little to similar to the AC adaptor plug. In the past, HP calculators tended to appear with little or no notice. Because of HP's small market share in educational/graphing calculator market and because this was a new category of devices, HP decided to make the development of the Xpander far more public. Thousands of units were shipped to teachers and other evaluators. Educators were initially concerned about unfamiliarity with a stylus-based interface but then decided it was better than other options such as mice. The Xpander's demise was also very noticeable. A spokesperson for HP said that response from Educators was good but that the device didn't have a broad enough appeal. Possible reasons may have included a price somewhat too high for students and concerns about the durability of the large touch screen in a school environment. It may have also simply been a casualty of large reorganization at HP. HP did ensure that the Math Xpander software was made available as a free but unsupported download for Pocket PC devices with a MIPS, SH3, or ARM processor. The unit shown below is a prototype that works quite well. The Keyboard is not up to the standards of HP's best but that might have been fixed in production units. Display contrast is also not quite as good as some PDAs but that might have been fixed too. Price: Unknown - probably in the $150 to $250 range. Introduction-Discontinuation: Never actually introduced. Previewed in mid 2000, cancelled in 2001.